Bring this upholstered chair and ottoman into your living room set and make it the most comfortable seat in the house. 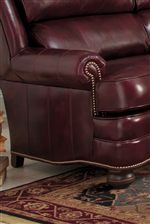 This chair features a comfortable semi-attached inside back, rolled arms, exposed wood feet and intricate nail head trim detail around arm panel and base. It is also available as a tilt back in cloth and leather and also as a swivel tilt in cloth and leather. Pair with the ottoman for a perfect foot rest and to complete set. The ottoman also features a nail head trim detail and exposed wood legs. You won't go wrong with adding this chair and ottoman set to your living room set. Available in fabric or leather. The 311 Leather Upholstered Chair and Ottoman by Smith Brothers at Saugerties Furniture Mart in the Poughkeepsie, Kingston, and Albany, New York area. Product availability may vary. Contact us for the most current availability on this product. 311-C Upholstered Chair 1 37" 41" 39"
311-OT Ottoman 1 27" 20" 17"